1800 x 900mm (6 x 3 ft) 1:2 Ratio. Fly this handmade flag from your home, office, bach, backyard or pin it up in your home! Fly ends are quadruple-stitched for added reinforcement. These Silver Fern Flags are made from a strong synthetic fibre which dyes beautifully to give crisp, clear graphics and vibrant colours. this outdoor flag has a silk-like sheen and is beautiful enough to be displayed indoors, flags come fitted with sister clips. You can pay $130 for a flag of this quality, buy here and you will pay only $58! - delivery included. ​To commemorate the win of the silver fern flag design, by the vote of the New Zealand people, in the world's first ever national flag referendum, we have released a limited number of 199 handmade, dye-screen printed, hand-signed flags, by flag designer, Kyle Lockwood. These flags, complete with hand signed and numbered certificate of authenticity by the designer, price includes delivery. ​The Silver Fern Flags are quadruple-stitched and corner gusseted for added reinforcement. ​These are a popular and affordable choice. Best suited for inside display use or with limited external use. Fly ends of the flag are quadruple-stitched for added reinforcement. These handmade flags come fitted with sister clips, the flag fabric also has a silk-like sheen. ​You can pay over $60 for a beautiful flag of this quality, buy them now and you will pay only $36! - delivery included. Never be mistaken for an Australian or UK tourist! Avoid colonial confusion and show your support for NZ, a must for travellers, or those about to do their OE! Ideal for ironing or sewing onto your travel bag, or clothing. These patches are high quality, fully embroidered, and have fade resistant threads. You can pay around $16 for a patch of this quality, but buy them online here and you will pay our special price of only $14 - delivery inclusive. Our beautiful silver fern flag has been made into a high quality lapel pin which you can wear on your jacket or hat with pride. or give as gifts. The pin is of excellent quality, in solid metal (matt finished nickel) the colours have been enamel sealed with resin to ensure your pin lasts. Buy our beautiful pin, $13 - delivery included. 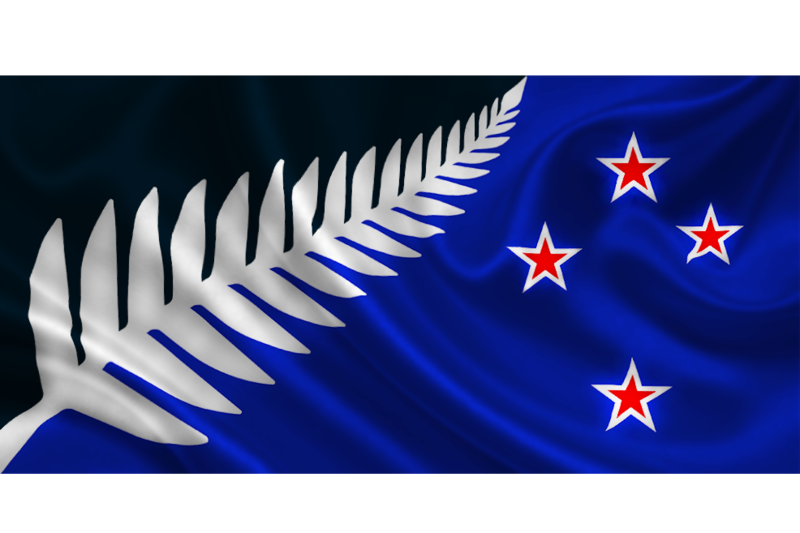 The original Silver Fern Flag by Kyle Lockwood. ​Our flags are handmade and are dye-screen printed, All prices shown are in New Zealand Dollars and are delivered prices, there are no extra taxes, or post and packaging fees payable, we won't surprise you with any extra charges on check-out. In order to keep our costs low, our flags are sent via standard post. once dispatched, ​flag items typically arrive around New Zealand within 15 working days. Please note, no refunds for change of mind.